The Conqueror is a projected series of games that will focus on history's great conquerors, those figures whose vision, greed for power, and remarkable military abilities have changed the map of the world, sometimes fleetingly, often permanently. 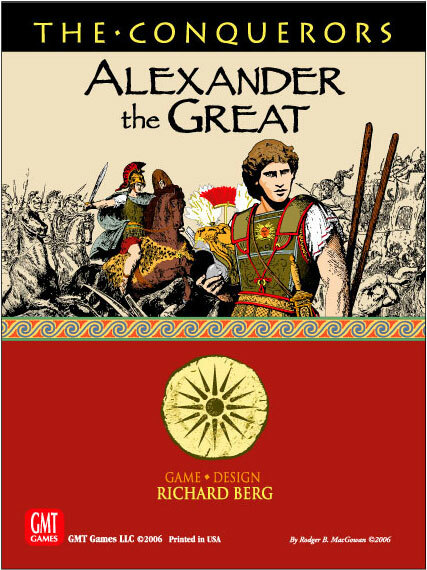 The first game in this new series is Alexander the Great, a game that covers the career of the fabled King of Macedon, from his ascension to the throne until his army has "Hellenized" half the known world. Alexander uses an interesting new system that gives the players a feel for the era and the problems of campaigning therein. For one, there are no turns. Play keeps going until the Macedonian Player wins or Alexander dies. And winning, for the Macedonian Player, is no mean feat. Yes, his armies are mighty, but Alexander is a game in which the player must not just win battles, but also overcome the logistics of campaigning â€¦ building armies, getting them to where they're needed, understanding battle fatigue and weariness, dealing with personalities, and adapting to the society you are trying to seize. The player's goals, as Alexander, are multiple and difficult. To win, he must maintain his hegemony of Greece, become Great King and establish his Diety. The latter two require him to achieve eight separate, often difficult objectives, including controlling key provinces, building Alexandria, gaining control of the Royal Family, and invoking proskynesis (homage by prostration). A clever Persian player has many ways to stop the Macedonian from earning these, and the money and manpower to help him. Given Alexander's "greatness," playtesters found the game to be remarkably balanced. Alexander uses cards, but it is not a game "driven" by cards - this is not a Paths of Glory system game. Rather, it uses them to provide the players with the historical opportunities and outside events that shaped Alexander's campaigns. The cards cover such events as Alexander's drinking problems, the shadowy figure of Bagoas, the friendly presence of Black Cleitus, and possibilities of assassination, mass marriages, Spartan revolts â€¦ even a Honeymoon for the weary Macedonians! Combat uses a fun, two-tiered battle resolution system that accounts for many more factors than just numbers, and often leaves armies- even winning armies- in far worse shape than you may want. The Conqueror: Alexander the Great is a game rich in historical detail, a game that places major burdens on the players to achieve victory, and a game that's great fun! It can be played by two to four gamers in around 4 hours, and it can be played solitaire.